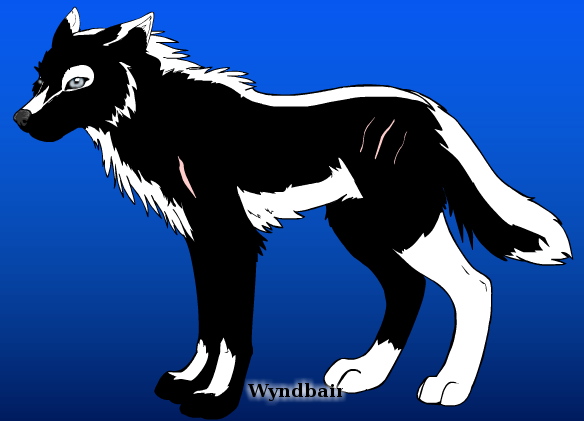 Appearance: Frost's base coat is black, but he gets his name from the white that edges his coat. He has a white stripe that goes down his back from the top of his head to the tip of his tail. His muzzle has a marking that looks like a spear head, plus a line on each side that goes up to his eye and thickens around it. His ears are tipped with white and his chest and underbelly are also white. His eyes are steel grey. His two front legs have markings up the front of then while his right back paw is white, and his left leg is also completely white. He has various scars that run over his body, some visible and some not. Personality: Frost tries to be nice, but sometimes it doesn't seem that way. He's just not a nice wolf. He's a very quick thinker and doesn't crack under pressure. He's rather straightforward when he tells you something and prefers not to waste time chit-chatting with others. He's blunt and gets straight to the point. Though he's much better at taking down prey, Frost doesn't mind a good fight. Past: Frost lived a rather normal puphood, not knowing that his power was abnormal. He didn't know that his mother's fur was a warm mocha brown, or that his father's eyes were blue. He just thought that everyone looked like what their heat signature did. He wouldn't have known his own fur color if his mother hadn't told him what it was. The first person to notice his power was father. He had been lead hunter in his first pack. It had began one day while his father was teaching him how to hunt. How Frost could find prey hidden in bushes without scenting the air, or how he could find up to 3 day old tracks with ease and not lose the trail. 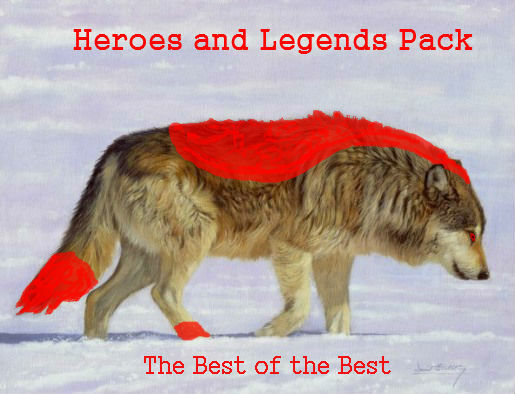 His gift had scared his father, his own son would be his competition to keep his position in the pack. So his father had told the alpha of his son's powers. The alpha saw Frostbite as a cursed wolf and banished him from their lands. He wandered around for two years, becoming even better at hunting and tracking as the years passed. Now he's just hoping that this pack will accept him for what he is. Negatives: Frost hates wolves that waste their time instead of doing their job. He's also not a big fan of water or heights. Positives: He loves to be outside at night, whether it be for a hunt or simple run. Gifts: His speed and cunning. Welcome to the pack, frostbite.